Click here for IMCNews legal update. Please pray for me and my family. 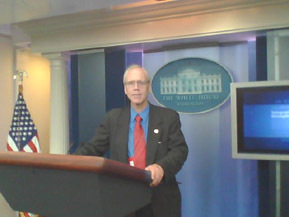 Click here to read about Dr. Harper's White House Press Corps trip to Israel/Ramallah for President Obama's events. Click here to read about Dr. Harper's White House experiences. Click here to download my ancestry to French and English Kings through the Reding Family line. My guest music appearance singing You Can Be As Full As You Want To Be on Faithline Television in San Diego, California January 27, 1986. Diego, California January 27, 1986. Your life is no good," the sinister voice whispered. "Why not end it? You're not going to turn out to be anything, anyway. Give up." "Why not?" I agreed, tipping the cleanser bottle closer to my mouth. "Death would be better than hanging around this sick place." It certainly appeared that my father's warnings had come true. Here I was, ready to drop over the edge of suicide, confined in the same mental hospital where my mother had once been for allergic reactions. "You're just like your mother....nuts," Dad would grumble whenever one of our frequent conflicts arose during my childhood. My parents had six children in all. We experienced only limited evidence of the happy Christian life we heard about at church every Sunday. (pictured below is me second from the left while living in Idaho Falls, Idaho - 1969). My mother Kathryn and I were so close at her recent passing - she was trusting in JESUS as her SAVIOR when she passed away on Thursday June 21, 2012. I miss you mother so much! (click here for her memorial information). Though I had a born-again experience at the age of nine, I never quite fit into the church scene. The youth group seemed extremely cliquish, making me feel like an outsider. By the time I reached my senior year of high school, the only people at school who seemed to be having fun were classmates who drank, smoked and took drugs. The temptation to use drugs was strong. But temporarily, I managed to avoid serious trouble. And when family finances prevented me from accepting a partial music scholarship to the University of Wyoming, life degenerated into a downward spiral. Depressed because I had told all my friends about the scholarship, I drifted through a succession of menial jobs like washing dishes, bagging groceries and working as a laborer. When I was suicidal at the age of 18 and called the Idaho Falls, Idaho Suicide Hotline, the counselor I talked with who befriended me turned out to be a drug dealer and introduced me to drugs. How I wish I would have told my parents about this experience. This experience led to many other experiences cruising the streets at night and to bars and parties, where I used drugs like alcohol, hashish, marijuana, mescaline and LSD. At age 18 I was helped greatly by the Shiloh Youth Revival Centers from 1969-1975. I lived in a Shiloh home in Idaho Falls, Idaho in 1971. Shiloh Youth Revival Centers (a part of the JESUS Movement associated with Pastor Chuck Smith of Calvary Chapel of Costa Mesa, California) was the largest network of Christian ministry homes that helped kids and adults on drugs - for more information regarding the Shiloh homes and ministry, click on the following link: http://www.shilohyrc.com Learn more about the JESUS movement by clicking on the following link: http://www.one-way.org/jesusmovement. Married at 20, I worked while I tried auto mechanics school, but I quickly learned my gifts lay elsewhere. Soon we had a daughter and I was not able to handle this extra responsibility very well. Floundering in the mechanical arena, I was extremely frustrated, unable to use the musical talent I felt the Lord had given me. In addition, my health was bad-- I suffered from hypoglycemia for many years before it was properly diagnosed and treated--and emotionally I was very unstable. I felt like such a failure as a husband and father and thought I was losing my mind. However, a year after our marriage GOD blessed me with enough resources to enroll at Idaho State University in Pocatello, Idaho. I also got involved in the Christian coffee house ministry (the Son Shine Inn) near my home in Idaho Falls, where some people prayed for me and I rededicated my life to Jesus. As a result, I developed more excitement about the Lord and found a new boldness to talk about Jesus. I wish I could say that this experience brought an end to all my troubles. Instead, they were just beginning. The first shock came when my wife one day said, "You leave or I'll leave." The local headquarters of a well-known religious cult, The Way International, had moved in next door and recruited her into the group. I was forced to leave my wife and child and didn't have enough money to fight for custody of my daughter Amy. Pictured above left to right: with my 2nd wife Mary Jane and my daughter Amy (CHRISTmas 1980) at our home in Meridian, Idaho. Please pray for me and my family to share in the joy of The LORD JESUS together. Over the next four years, I struggled through the equivalent of two academic years while working to stay in school. That proved to be a major mistake. The psychiatrist I had seen in 1978 gave me tranquilizer shots, which triggered severe allergic reactions, such as convulsions and symptoms of Parkinson's Disease. However, when I told the doctor he was giving me too much of this anti-psychotic drug Prolixin, he didn't care for my advice. Soon after that, he suggested admitting me to the mental hospital. Within a week, I checked out because I couldn't stand the place. I was also scared by my bad reactions to this medicine and constantly battled overwhelming, powerful demons of depression.After a lonely Christmas, I went to see some friends in a nearby town and on my way home, suicidal thoughts invaded. When I got home, I swallowed a whole bottle of tranquilizers. Fortunately, a friend took me to the hospital. Since it was a crime in Idaho to attempt suicide, when my psychiatrist found out, he had me arrested and handcuffed me and placed me into an isolated and cold jail cell. I was barbarically treated like a criminal with a mug photo shot taken of me and fingerprinted. The following day, I was handcuffed and taken back to the ungodly state mental hospital to be further tortured by humanistic psychology and drugs. There was no attempt to take a healthy approach in treatment. There's no worse setting for those struggling with emotional problems than a non-Christian psychiatric hospital where nutrition, vitamin and mineral, light and exercise therapy are not part of treatment. It was a negative, depressing and spiritually oppressive environment. I still remember a lady there who would often cry out every day at lunch, "My God, my God, they're killing me." I realized at this moment she was talking about the demonic attack on her through the ungodly staff there at the hospital. In addition, most of the staff seemed cold and detached (too Freudian). The hospital didn't have enough people to handle the work and counselors were so overburdened with paperwork they had little time left for the patients.Satan and the presence of evil were so strong that I finally yielded to the enemy's oppression. A month after being there, the demonic voices I heard in my head started whispering and in a fit of desperation, I gave in again to the temptation of suicide. But when I swallowed the cleanser....nothing happened! Nor did anything happen again a week later when I swallowed petroleum-based cleaning fluids! I realized then that God had kept me from getting sick or dying. I was living proof of Mark 16:18: "...when they drink deadly poison, it will not hurt them at all..."
Though the staff had told me if I didn't take the drugs they prescribed, I would be there forever, they released me just two months after I arrived. One counselor didn't think I fit the standard profile of a state hospital patient and when I secured a job as a gas station attendant, they agreed to let me go. That job only lasted for a month, and after living with my sister a short time, I then moved to Nampa to live with my grandmother. She sent me to see her doctor to find out what was wrong with me and he discovered that I was suffering from Hypoglycemia, or low-blood sugar. Immediately I began eating a high-protein, low-carbohydrate diet. I avoided sugar, white flour and other foods that were causing allergic reactions. The improvement was remarkable! I discovered a year-and-a-half later that the state hospital diagnosed my condition of Hypoglycemia while I was there, but never emphasized the importance of this problem in relation to brain health. Today in my counseling ministry, I often recommend proper diet and exercise for people suffering from depression and other problems, and many see similar benefits to implementing a healthier treatment plan. Two-and-a-half months after my release from the mental hospital, I was able to attend the Ron Bailie School of Broadcast in Portland, Oregon. There, aftertwo months, I completed my First Class Broadcast License. This was the first real accomplishment I had felt good about. After receiving my broadcast license, I went to work as a switcher/engineer for a television station in Idaho Falls. While there I was not able to function adequately enough to please my supervisors, so I decided to go back to stay with my grandmother, after a short stay with my dad in Boise. My nine-month stay at my grandmother's helped me get back on my feet in numerous ways. In addition to finding the road to good health, I resumed my music studies at Boise State University and an active relationship with the Lord. Click Here To View Boise State University's web site. In August of 1980, I remarried, to a beautiful woman who proved to be a strong, additional supportive influence in my life. However, it would still take awhile before I found the calling that the Lord had for me. At first, I thought it was in music. 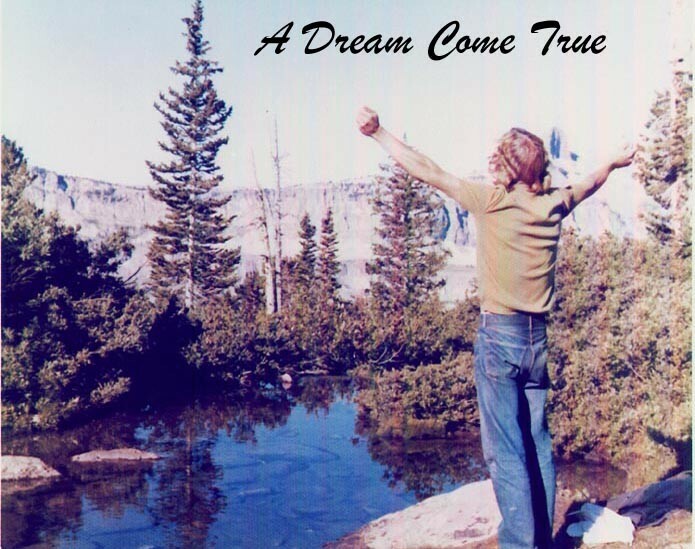 My exciting adventure of recording my first solo gospel inspirational record album near in Aurora, Colorado in May of 1981 was a real dream come true. In early 1982 with the help of God, I organized my first gospel concert tour and periodically traveled throughout 1987, singing and sharing my testimony in a total of 32 states and part of Canada. Click here To View my music web site. But I still felt there was more. And as I prayed, I heard Him telling me to be of help to people. For awhile, I struggled with exactly what that meant. Many believers in the Lord would say, "You would be good in the ministry. You have a caring heart." While they were right about my heart, they were wrong about the area of service. We certainly need all the good pastors we can get, but God equips believers to serve in countless other occupations and endeavors. Through an external degree program from the University of The State of New York (Regents External Degrees - now called Excelsior College) located in Albany, New York, I had finished my Bachelor's degree (B.A. in Liberal Studies). Then, I felt the Lord's direction to obtain my Master's degree in General Guidance and Counseling from The College of Idaho. At The College of Idaho, I witnessed to fellow counseling students and professionals in this field, many desperately in need of the answers only JESUS can provide. Though I often feel ostracized for standing on God's Word, many of my cohorts have thanked me for sharing my faith. Because of my exposure to the secular counselor system and drug use, I gradually realized the Lord wanted me to reach those in the same type of dire situation that I had experienced. 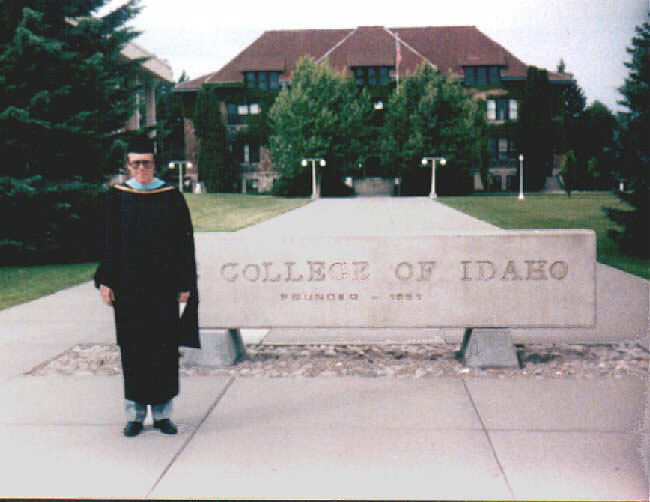 Anthony Harper receives his master's degree, June 1987 , from The College of Idaho. Click Here To View The College of Idaho web site. After completion of this degree, I had a dream of completing a doctorate degree. This dream started when I enrolled in the doctorate degree program in psychology at California Coast University in Santa Ana, California during August 1989. Seven months after obtaining my Master's degree in 1986, with the help of God I founded Shiloh Counseling Center, Inc., in Boise, Idaho. Formed as a Christian nonprofit counseling center, the Shiloh Counseling Center's purpose is to be of help to individuals and families find true meaning and happiness in life. With GOD's help, four years after graduating from The College of Idaho, I enrolled in the post Master's credits in counseling from Liberty University and completed 18 semester credits. Click here to view Liberty University's web site. Finally, after seven long years of working on my degree at California Coast University, I graduated in August of 1996 with a Ph.D. in psychology (what a miracle and a relief). I give my God (The Father, Jesus and The Holy Spirit all the credit for these and many other accomplishments - I can do nothing apart from Them and I praise Their Holy Names forever and ever!). Anthony receives his doctorate (Ph.D.) in psychology from California Coast University, August 1996. Click Here To View California Coast University's web site. Because so much traditional psychology is based on worldly humanistic answers and denies that God (The Father through Jesus His Son and The Holy Spirit) is the answer for human problems, often Christians often shun anything that smacks of "psychology". But when someone faces feelings of helplessness or being overwhelmed, professional Christian counseling (that is based on God's word in the Bible) can steer them in the right direction. Business people with problems don't hesitate to consult experts. Likewise, an expert in true Christian counseling can be of service with life's problems. And, the presence of Christians in the counseling ministry is especially critical today. There is a strong New Age flavor in modern counseling/psychological practices, but the world's trend towards "spirituality" is not the true spirituality of the Bible. Rather, it's the type where persons are told they are a God unto themselves (too self occupied instead of being occupied with God). The new age movement is a dangerous philosophy, yet it's taught in numerous ways (and in arenas ranging from our public schools to self-help business seminars). Some of the forms of the New Age teaching are the human potential movement.....lessons on tapping your inner power....or those stressing past life experiences and the use of hypnosis. Some of it manipulates people like "neurolinguistic programming and hypnosis". It's nothingmore than a method of learning to control behavior without God's help. With my FATHER's help, I press onward toward the goal of CHRIST JESUS! At one time, satan tried to convince me I was utterly worthless, because he knew I could be used for God's kingdom. Regardless of our talents or abilities, the enemy (satan and his fellow demon assistants) never wants us to accomplish anything good or help anyone. Maybe you have listened to satan's lies and think you have little value. It's not true, because God loved you so much He gave His only begotten Son that you might rely upon His Son and have eternal life. 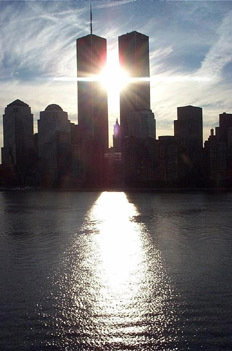 No greater love, or caring, exists. 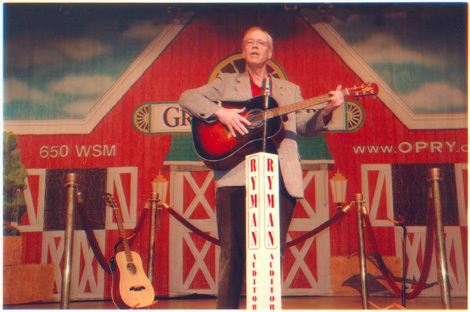 Click here to listen to Anthony singing 'Amazing Grace' recorded at the Grand Ole Opry in Nashville, Tennessee May 29, 2009. Click here to send an e-mail to Dr. Harper. October 16, 1993 (New York City). Photo by Bob Bergen, Connecticut. Click here for the 'Keep America Safe' web site. I was in Texas , Virginia , California, Michigan, Afghanistan. I was standing next to you when you heard the terrible news. Did you sense Me? 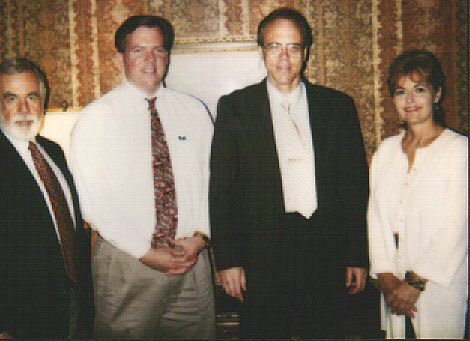 Since completion of my doctorate degree (Ph.D.) from California Coast University in 1996, I've continued providing Christian counseling to those who cannot afford help and am now the publisher of our local Christian newspaper Intermountain Christian News (formerly known as Treasure Valley Christian News) (http://www.imcnews.org), and our outreach ministry to youth called Intermountain Teens (http://www.intermountainteens.com). Since I do not receive very much income from serving in the ministry, please pray for me as I need to raise my own missionary support to continue to serve in the following ministries of: Intermountain Christian News (http://www.imcnews.org), and our outreach ministry to youth called Intermountain Teens (http://www.intermountainteens.com). Those that would like to support our IMCNews ministry, please contact me as soon as possible. Donations are tax deductible and can be made online at the IMCNews web site by clicking on the "Click here to support IMCNews" banner on our right navigational panel (IMCNews/IMTeens have IRS 501 c3 non profit status). Advertising revenue received for Intermountain Christian News is not enough to cover all our production expenses and we need more people to partner with us to ensure the continuance of our Christian news voice for our Intermountain area of Colorado, southern Idaho, Montana, Nevada, eastern Oregon, Utah and Wyoming. Vilsack's response to my question of "......a rain prayer or rain dance"
1. Pray for my wife and I for legal victory at the Idaho Supreme Court and Federal Court regarding my auto accident injuries. We need financial help to pay for a good attorney to represent us. InterMountain Christian News is without a vehicle! Need donations for purchase of a vehicle. Donations are tax deductible and can be made online by clicking on the ‘Donate’ banner ad at the web site of: http://www.imcnews.org/paper/support.php or call our office in Boise, Idaho at (208) 703-8688. Anonymous donations can be made at the Northwest Christian Credit Union in Boise, Idaho in the name of the InterMountain Christian News account - click here for the Northwest Christian Credit Union web site. 3. On Monday, November 19 of 2012, I was approved for travel with the White House Press Corps on Air Force 2 whenever President Obama or other White House representatives are traveling and would appreciate your prayers that a door would open up for me to be directly with the President on Air Force 1 for his trips internationally and/or domestically. Pray that I will be able to ask questions that represent our Christian concerns. For those who can help fund my trips totravel on White House trips, please call me in Boise, Idaho at (208) 703-8688. I plan on attending White House Press conferences. Please pray that President Obama will be there and call upon me and that I will ask the question GOD wants me to ask. Also, do you know of anyone who could sponsor my travel and housing cost - I need to raise $1,400 to cover my airfare, motel and other travel expenses. Donations are tax deductible and can be made online at our following web site by clicking on the 'Donate' button: http://www.imcnews.org/paper/support.php. 5. Pray for my health - the doctors have diagnosed me with Mild Traumatic Brain Injury and Obstructive Sleep Apnea. In addition, I need healing in my left shoulderbecause of a previous surgery. 6. Pray for me in raising support as a Southern Baptist Chaplain for my ministry to help individuals and family in need and for my raising support for our InterMountain Christian newspaper to serve Christians in our intermountain area. 7. Please pray for me and my family regarding the recent loss of our mother Kathryn - pray for GOD's comfort and strength. We miss our mother so much. Click here for her memorial web site. 8. Please pray for donations that are needed to build the first Christian hospital mission in the United States for kids on drugs - click here to learn more about theChildren of Hope Family Hospital. Below is a very special poem which explains my purpose in life. I hope you enjoy it. "When I Come Home To Heaven"
How joyful it will be! My risen Lord I'll see. To see Him face to face. And feel His warm embrace. The grace of Jesus' love. Weigh down upon me so? When home at last I go. Rev. 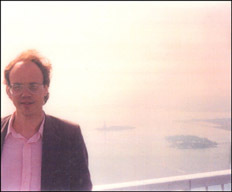 M. Anthony Harper, Ph.D.
Editor/Publisher (8/2002 - present). CoFounder of a non profit Christian newspaper 'Treasure Valley Christian News d.b.a. InterMountain Christian News' and our outreach teen help web sites 'TreasureValleyTeens.com and InterMountainTeens.com'. TVC/IMCNews is a print publication and also in electronic format and distributed in 8 states in our intermountain U.S. region (Colorado, Idaho, Montana, Nevada, North Dakota, Oregon, Utah and Wyoming). Our main web sites are www.imcnews.org, www.intermountainteens.com. Counselor ( 8/87 - present ). Founder and executive director of a nonprofit Biblicalcounseling ministry Shiloh Counseling Center, Inc. and also in private practice from a Christian faith based treatment philosophy. Providing counseling services to economically disadvantaged children, adolescents and adult individuals and families dealing with the following topics: marriage and relationships, substance abuse and other addictions, sexual abuse, depression, anger control, hyperactivity, grief, sense of worth, personal growth and career/vocational. Substance abuse, mental status and career/vocational evaluations are also provided. Click here for Shiloh Counseling Center web site and click here for Harper Counseling web site. Music Evangelist/Gospel Concert Tenor Soloist (1981-1987). As a musicevangelist/tenor soloist, sang in Gospel concerts and was a guest speaker at churches and on television and radio programs. My music web site is: www.anthonymusic.com. Instructor (1997 - 2006). Teaching the "Self Esteem - A Biblical View" workshops through the Community Education Program in Boise , Idaho . Drug Abuse/Nutrition Guest Speaker (1/81 - present). As a traveling Gospel tenor soloist, I shared information on drug abuse, suicide, and nutrition (including my own story of recovery) on television, radio programs, and at churches, schools and other locations throughout the United States and Canada . Assistant Drug Counselor (3/85 - 5/85). Co‑counseled individuals in a communityresidential drug abuse treatment center, Port of Hope , Caldwell , Idaho . Dissertation topic: The Relationship Between Religiosity and Depression: A Correlational Study of The Harper Religion Scale, the A Religion Scale, and the Beck Depression Inventory. Click here to download State of California endorsement letter for my Doctorate in Psychology program. 1990: Author of the Spiritual Relationship Scale (an assessment tool for eleventh step work in twelve step recovery therapy dealing with spirituality, substance abuse and other issues).